When it comes to finding farm fresh food, it’s hard to find a better spot than your farmers market. We all know you’ll get a great selection of local food. But here are some fun facts you might not know! How many? There are more than 8,700 farmers markets in the U.S. registered with the USDA Farmers Market Directory. And, approximately 115,000 farms in the U.S. participate in farmers markets, run vegetable stands or sell directly to local businesses. Most farmers are within a 50-mile radius of the markets they attend, so there’s less of a strain on the environment for them to travel back and forth. 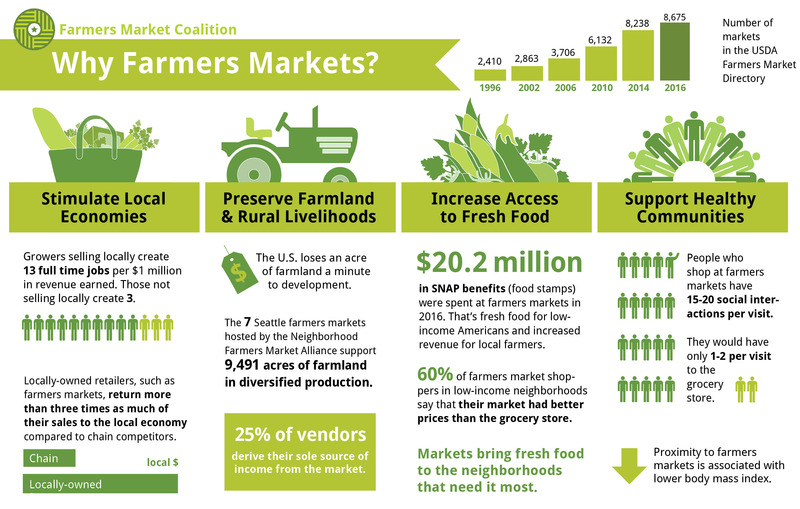 When you shop at your local farmers market, you’re helping to reduce your carbon footprint. And because your food doesn’t have to travel far, it’s fresh and tasty! Plus, many farmers use sustainable techniques. Practices like growing cover crops, running no- or low-till operations and composting help maintain their soil’s health naturally. People shopping at farmers markets have an average of 15-20 interactions with others. Now that’s some good face time! We sure find this one interesting… We all know fresh fruits and vegetables are healthy. But, did you know that people who live closer to farmers markets have a lower body mass index? Although there’s no direct correlation between the two, consider yourself lucky if you live near one! Buying fresh produce can save you big in health care costs down the line. It’s estimated that upping our intake of fresh fruits and veggies to the recommended daily servings could result in $17 billion in savings in medical costs in the United States. And, local retailers like farmers keep money in their communities — about three times more of their sales stay local than that of chain retailers. When you shop at the farmers market, we all win!